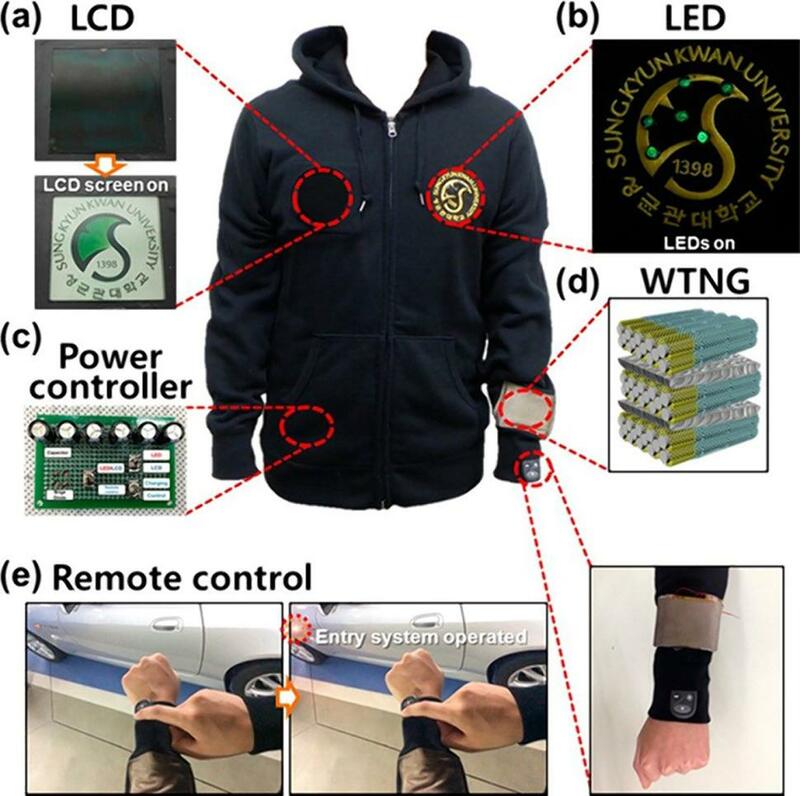 What if the jacket that you were wearing to keep you warm, also had the capability of generating electricity from your tiniest movements such as your heartbeat or blood flow to the larger movements from you walking around to use for powering integrated electronics or sensors. Well researchers at Sungkyunkwan University and the University of Wollongong are one step closer as shown in their paper “Nanopatterned textile based wearable triboelectric nanogenerator” published in ACS Nano. The triboelectric effect occurs when certain materials become electrically charged when they are rubbed against a different material. Rubbing a balloon on your hair builds up triboelectricity and most static electricity shocks that you get from your winter clothing are triboelectric. The rubbing action causes one of the materials to transfer electrons to the other, and if the surface area of the rubbing surfaces is large enough, results in a massive excess of electrons which can then be used to power devices. Nanofibres have a large surface area to volume ratio meaning that they are able to create very large rubbing surfaces in a very small space, thus increasing the number of electrons transferred. To listen to my Radio Live chat with Mark Sainsbury about the technology click on the image. The triboelectric effect is not new and previous attempts have been made to try and create clothing that charges devices, however their main drawback has been durability. Clothing typically has to withstand abrasion and wear forces without being rubbed off. This study solved that issue by using the polymer PDMS as a fibre coating on top of the ZnO nanorods which were laid onto the silver coated fabric resulting in no loss of voltage after 12,000 cycles. Although still a prototype device, the study moves researchers closer to solving one of the biggest issues with wearable tech fibres of how to increase the usable lifetime of the fabric. Anything that means I don’t have to charge my phone every three-and-a-half minutes has got to be a good idea!